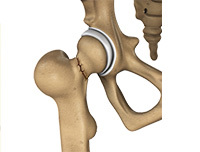 Hip replacement surgery is the most common orthopedic surgery performed. It involves the replacement of the damaged hip bone (ball shaped upper end of the femur) with a metal ball attached to a metal stem that is fixed into the femur and attached to the pelvic region. Traditionally, the surgery was performed with a large, open incision and required the patient to stay in the hospital for several days. With advanced techniques, it is now possible to perform these surgeries on an outpatient basis where the patient goes home on the same day. Outpatient hip surgeries use the same implants as traditional surgery but involve a smaller incision and newer exposure techniques when compared to the traditional procedures. This type of surgery is less invasive to the tissues and bones and involves a much shorter hospitalization time where the patient can go home the same day. Outpatient hip surgeries are mainly targeted at treating the joints damaged by arthritis and injuries. Chronic joint pain due to erosion of cartilage, damage due to accidents and autoimmune diseases, or bone death leading to the destruction of cartilage are also treated with the help of this surgery. Outpatient hip surgery is designed to allow surgeons to replace the damaged hip bones through 1 or 2 small incisions. The single incision measures around 3 to 6 inches compared to 10 to 12 inches for traditional surgery and is usually placed on the outside of the thigh. If two incisions are used, there will be a 2 to 3 inch cut over the groin and a 1 to 2 inch cut over the buttocks. The muscles and tendons are separated to expose the hip socket and femoral head, similar to traditional surgery, but to a lesser extent. The head of the damaged femur is removed and the hip socket is cleaned. The stem and ball prosthetics are then fitted into the end of the femur and cement may be used to secure them. The hip is then rejoined and the surrounding tissues are brought back to the normal position. As the incision is very small, fewer muscles and tendons are traumatized. Complications in outpatient hip surgeries mostly arise due to difficulty in performing the surgery within the restricted visual field. Some of the complications include, tearing of skin and soft tissues, superficial nerve injury and bone fracture during implant insertions.